Last week, Nikon announced the impressive new D3 digital SLR camera. 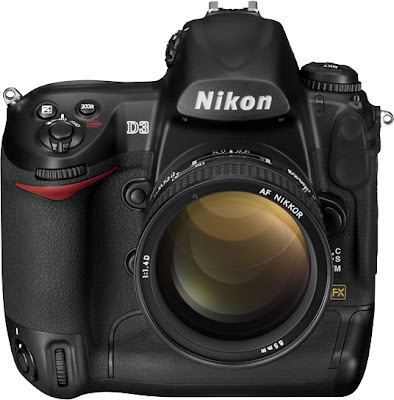 The D3 is Nikon's first foray into the full-frame DSLR market, with a new 35mm CMOS sensor developed in-house at Nikon. Previous Nikon DSLRs have incorporated Sony sensors. The 35mm sensor yields an effective 12.1 million pixels. The camera also sports Nikon's new EXPEED digital image processing system, another technology apparently developed in-house at Nikon. As I understand it, this is Nikon's answer to Canon's DIGIC digital image processor. The D3's strengths seem to be speed and low light sensitivity. It can capture 9 frames per second in full resolution and can capture images at an ISO equivalent of up to 25,600. The superb photo equipment review site dpreview.com has a preview of the D3. The camera is estimated to have a retail price of 5000 USD when it arrives in November, putting it beyond my current means. I'm only an amateur photographer after all (I'll gladly accept donations though, so if anyone wants to finance my dream of owning a D3, please let me know!). 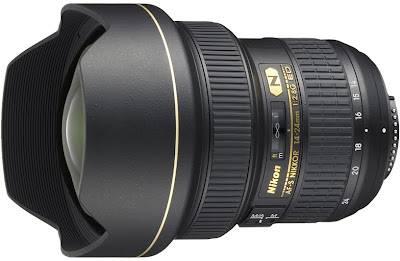 However, the new AF-S NIKKOR 14-24mm f/2.8G will sell for a slightly-more-reasonable 1800 USD, and just might end up on my shopping list when I'm in the U.S. later this year. This is the lens I've been wishing Nikon would make ever since I bought the D200 a year and a half ago. Unlike the plastic 12-24 f/4, this new lens is made of metal and has the same build quality of Nikon's other professional lenses (such as the 70-200 f/2.8). It's also one f-stop faster, with a maximum aperture of f/2.8 throughout the whole zoom range. Lastly, it's a full frame lens, not a DX lens; so it will work on the D3 and subsequent full frame cameras from Nikon. By the way, Nikon is calling the full frame format of the D3 "FX" to distinguish it from 1.5 crop factor "DX" format of all of Nikon's previous DSLRs. Along with the D3 and the 14-24 lens, Nikon also announced a new 24-70 f/2.8 lens and the three new telephoto lenses, all of which sport Nikon's new nano crystal coat to reduce interior reflections. Incidentally, Nikon also announced the D300, the worthy successor to the D200. It will sell for the current price of the D200, and Nikon seems to plan to market the two cameras simultaneously; so no doubt the D200 will see a drop in price when the D300 arrives in November. The D300 looks like a very nice camera; but it doesn't represent a large enough improvement over the D200 to justify shelling out nearly two grand for the ugprade. I've only had my D200 for 18 months, and I am hoping it has a few more years of life left in it. Speaking of that, I took my great little 18-200 VR zoom lens to the Nikon office here in Stockholm yesterday because the mounting ring for filters and the lens hood had come loose. A very helpful technician named Torbjörn fixed the lens while I waited. Unfortunately, there was a small problem: the ring was not put back on correctly. When I attached the lens hood, it wasn't aligned with the camera, so portions of the hood were visible at the near end of the zoom range. I took the lens back to Nikon today and Torbjörn quickly fixed the problem. To compensate me for my trouble, he also replaced the rubber on the grip of the camera free of charge. That's excellent customer service. With the new rubber on the grip, the camera looks almost brand new again. Now if only I had remembered that my 18-200 lens was still under warranty! I bought the camera back in June of 2006, and I must have had this date in my head when I took the lens in for repair. I forget that I didn't get the lens until last November. So yes, it's still covered by Nikon's one-year worldwide warranty. I'll call Nikon tomorrow and see if they'll be willing to refund the cost of the repair. It was just 500 SEK, sure; but if I'm going to shell out 1700 USD for the new 14-24 lens, I have to save my nickels and dimes wherever I can.